Just over a year ago I won a set of Ogham staves at Pagan Federation London's Gaia-Sol convention. 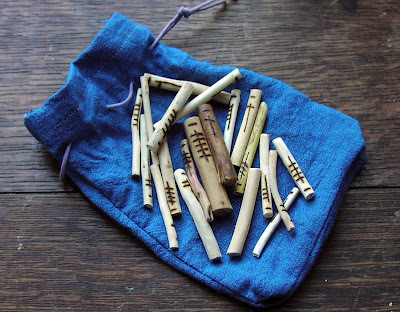 These were a set of wooden sticks carved with Ogham symbols - or runes - in a hand-dyed blue bag (pictured above). They were beautiful and fascinating, but also a little puzzling to me because I didn't know much about Ogham and the set didn't come with any instructions. A little web searching taught me that Ogham was an early Irish alphabet and that each rune was associated with a tree. Shortly after my win, I was also lucky enough to be sent a book to review called The Signs and Symbols Bible. This included a list of the Ogham symbols and gave their very basic meanings - which was some help, but hardly sufficient to learn how to use them. So, the Ogham got put in a drawer with various other divination sets and magical equipment that doesn't often get used. It stayed there until last weekend. The reason for my recent renewed interest in the Ogham was a wonderful talk called Ogham and Druidic Tree Magic by druid, musician and songwriter Damh the Bard at Witchfest International 2010. Unfortunately, the first thing Damh the Bard said was that using a set of Ogham made by someone else wasn't the right way to go about things - to really understand druidic tree lore you needed to get outside, find each appropriate tree, study it - maybe hug it a bit, after you've got to know it - and collect your own set of twigs to carve the correct symbols on. Oh well, I know I'm a Bad Witch. I'd love to go tree hugging one day - maybe when spring returns - but on these cold autumn days I think I'll start learning about the Ogham with the set I won. Maybe I'm kidding myself, but winning a set sort of makes it feel a bit more special than just ordering one on the internet although I admit I'd probably do that if I hadn't won one. Damh the Bard explained that each tree's meaning is associated with its role in the forest and significance to man. For example, birch is the tree of new beginnings because it tends to be the first type of tree that grows in woodland, and rowan berries have a five-pointed star at the bottom - a pentagram - so the rowan represents magical protection. There were 20 original Ogham, with five more added at a later date. The character representing each tree is a series of short lines running across a central downward line. These are very easy to carve on wood or stone - stones being the main things that surviving examples of historic Ogham are found on. Ogham staves can be used for divination - the easiest way to do this is to draw three sticks from bag at random, to represent the past, present and future. I had a go at this after I got home from Witchfest. My reading was: past - elder, a life of learning (OK, I thought); present - vine, intoxicating (fair cop, I had spent some time in the Witchfest bar); future - alder, the future showing (yes, I do think my future involves a bit more use of my Ogham staves). Good reading. Damh the Bard's inspiring talk has certainly rekindled my interest in druid tree magic. Maybe I will get out and find each of those trees. If I do, after I've hugged it I will certainly write about it on A Bad Witch's Blog. Good luck with your quest to get your own Ogham sticks!